Aliens are invading the Earth. Shoot down all of the aliens before they land. The aliens move back and forth across the screen, dropping down when they reach the edge. As you clear enemies, the remaining enemies increase in speed and they fire more bullets. Use the four shields to avoid their fire. You can shoot the UFO that appears for Bonus points. Clear all the aliens to move on to the next round. Two blocks of aliens move in opposite directions to each other. The aliens appear one row at a time, moving in a single direction. 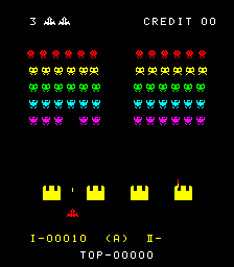 The aliens all move together in the same direction (as in the original Space Invaders).